I love site-specific theater, when a play is produced not in a traditional theater space, but rather in a location where it might actually take place. A dark office comedy in an office, a relationship drama in what looks like a Brooklyn apartment, or an early 20th century story of the wealthy and the help in the basement kitchen of the James J. Hill House. These very real locations make it easier to suspend disbelief, so that you feel like you're actually witnessing real happenings in a real environment. But as Gremlin Theatre found out last week, this sort of site-specific theater is not as easy as it looks. 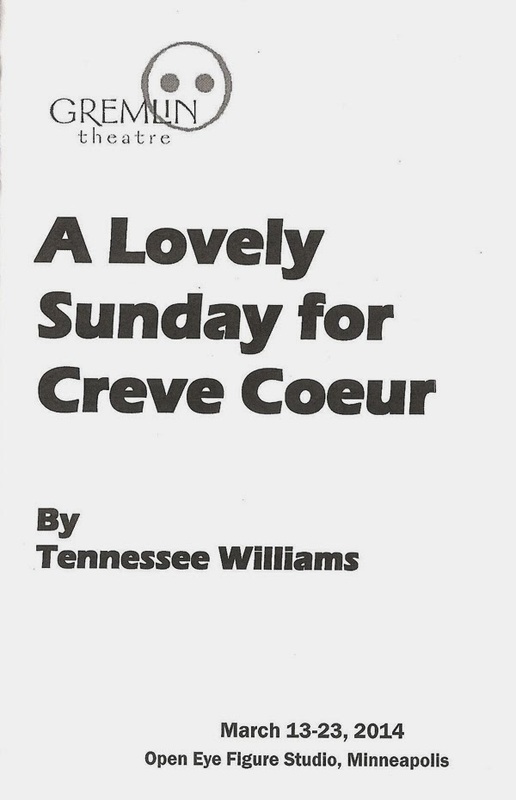 They were set to produce Tennessee Williams' A Lovely Sunday for Creve Coeur in a house in St. Paul, when they were informed of occupancy and legal issues just a day before performances were supposed to start. They were forced to suspend the production indefinitely, but were luckily able to quickly secure another location, an apartment owned by Open Eye Figure Theatre, proving the old adage of theater - "the show must go on!" And it just so happens that this is the perfect location for this funny, touching, and wistful little play set in a St. Louis apartment. Kudos to director Jef Hall-Flavin, technical director and scenic designer Carl Schoenborn (who can currently be seen onstage in Savage Umbrella's Rapture), the excellent four-person cast, and the entire Gremlin team for making a seamless transition in such a short time. The play looks as if it was always meant to play in that space. I have really come to appreciate Gremlin Theatre over the last few years, everything they do is so well-done and they make interesting and unexpected choices, so I'm happy to see them continue on after losing their permanent home last year. A Lovely Sunday for Creve Coeur is a wonderful production and a welcome return. Tennessee Williams (one of my favorite playwrights), is most well-known for the American Southern tragedies he wrote in the '40s and '50s - Cat on a Hot Tin Roof, A Streetcar Named Desire, and my personal favorite, The Glass Menagerie. Creve Coeur, written in 1979, is one of his later works but definitely bears a resemblance to those earlier plays. Set in St. Louis in the 1930s and focusing on one day in the lives of four women, it features the obligatory desperately and tragically in love Southern woman. Dotty has recently moved from Memphis to teach Civics in the local school, and is rooming with Bodey, a German woman intent on setting Dotty up with her twin brother (the title refers to the location of a picnic she's planning). But Dotty is in love with the school principal, and spends the day waiting for his phone call. Her friend and fellow teacher Helena drops by to collect money for the apartment they're planning to share in the nicer part of town. Helena looks down on Bodey and her shabby and colorful apartment. Bodey is fiercely protective of Dotty (and her plot to marry her to her brother), and tries to prevent Helena from telling her some devastating news. Complicating the situation is a visit from the upstairs neighbor Sophie, grieving the recent death of her mother and afraid to be alone in her apartment. There's no happy ending for any of these women (this is Tennessee Williams, after all), but as Dotty says, "We must pull ourselves together and go on. Go on, we must just go on, that's all that life seems to offer - and demand." The show is well cast. Suzanne Warmanen is always hilarious (see also: Pride and Prejudice and her many appearances in A Christmas Carol), but also gives Bodey a depth of feeling and heart beneath the busybody exterior. 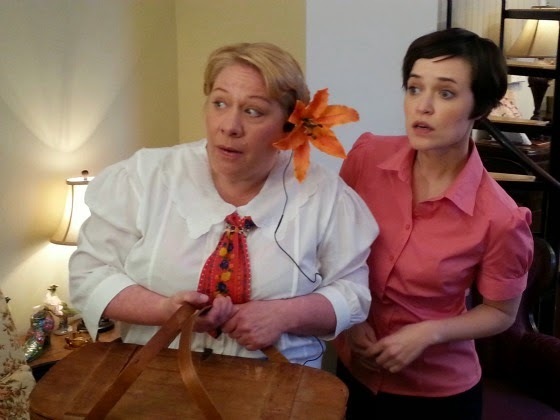 Sara Richardson, who can do broad comedy as well as intense drama, walks the line between the two and is pitch perfect as the classic Tennessee Williams Southern woman ala Blanche and Maggie the Cat. Sara takes Dotty from a happy and carefree young woman doing her daily exercises to a woman who's dreams have been crushed. As Helena, Jane Froiland is appropriately haughty, while also giving us a hint of what's underneath the polished exterior (see Jane in the hilarious locally filmed web series Theater People). Last but not least, Noë Tallen is equal parts humor (rushing to the bathroom because of what coffee does to her digestion) and pathos (wailing that she's "alein in der Welt" - "alone in the world") in her portrayal of poor Sophie. All of this takes place in a very realistic apartment, because it is a real apartment. Walking through the door next to Open Eye, you are presented with a long narrow room with high ceilings. First are few rows of chairs and stools for the audience, followed by the living room area opening up to the kitchen behind. Stairs on the right go up to the upstairs apartment. Colorful wall hangings and props adorn the space, and it's hard to tell which came with the space and which were brought in for the production, so organic does it feel. The four women move around the space, from the open door letting in cold air behind the audience, to the living room, kitchen, stairs, and even bathroom (which the audience members can use before the show and during intermission). Bodey really fries chicken (you can hear and smell it) and makes deviled eggs in the kitchen. The period costumes (by Clare Brauch) also feel authentic, from the frumpy housedresses of the German women, to Helena's beautiful period dress and hat, as pretty and proper as she is, and Dotty's simple but pretty new dress. It all feels very real. I once wrote "Tennessee Williams did not write comedies," although maybe he did, as this play is much lighter than his usual southern tragedy. But there are still elements of that tragedy, in a woman grieving her beloved mother, another desperately in love with a man who is not who she thinks he is, another hanging all of her hopes for happiness on someone else's possible relationship, and one who seems cold and selfish but is really just longing to not be alone. With just 40 seats and a reduced performance schedule, tickets may be hard to come by (the performance I attended was sold out), but it's worth the effort. There are a few discount tickets left on Goldstar, otherwise call or get your tickets online at the Gremlin website. Don't miss this chance to see a lesser known work by one of America's greatest playwrights, brought to very real life by a great cast in an authentic location.